Both the half / full marathon races will start on the Thames Path trail beside the Wraysbury Skiff and Punting Club Race HQ. 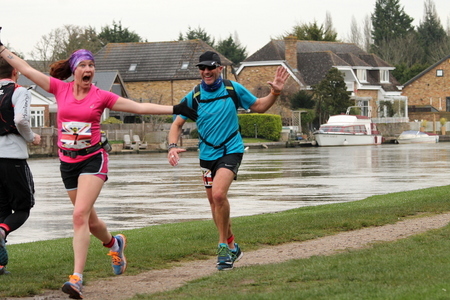 The half marathon route will initially be one 2.5 mile out / back loop to Staines Bridge, followed by 2 out / back 5.3 mile sections, to the Old Windsor Lock Check Point (turnaround point) along this scenic stretch of the River Thames path. The route for the full marathon will initially be 2 out / back 2.5 mile loops to Staines Bridge, followed by 4 out / back 5.3 mile sections, to the Old Windsor Lock Check Point (turnaround point) along this scenic stretch of the River Thames path. Both routes will be very well marked throughout with Hermes Running pink / black chevron ﬁxed directional signage all along the run routes. The courses will be also be well marshalled at both turnaround points and at the respective check points which will be well stocked. Both the turnaround points near Staines Bridge and the Old Windsor Lock Check Point will be very clearly marked and fully marshalled. If you’re looking to enter one of these events I have the half or full event distance options, so just make your selection from the corresponding event entry links listed below. For full info and FAQ's please see website.